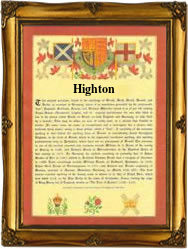 Recorded as Ayton, Hayton, Heighton, Highton, Hightown, Hyton and possibly others, this is an English locational surname. It originates from any of the places called Ayton, Hayton, Heighton, High Town, and Hyton, in the counties of Cumberland, Yorkshire, Lancashire, Nottinghamshire, Sussex, and elsewhere. The place name and hence the surname is derived from the pre 7th century words "heag tun", meaning either the high farm, that is to say a farm either above or beyond a main settlement, or a farm used only for summer grazing, or possibly a farm renowned for the quality of its hay, an important consideration in past times. A coat of arms of three black bulls passant, on a silver field, is an accurate reflection of the agricultural origins. The village of Heighton in Sussex is first recorded in the year 1150, that of Heiton near Brampton in Cumberland in the year 1199, and Hayton in the West Riding of Yorkshire in 1240. Early examples of the name recordings include Adam de Hayton of Nottingham in the pipe rolls of that county in the year 1202, and Henry de Heiton in the subsidy rolls of Leicester in 1327. Other interesting recordings include the christening of Annas Haton on April 9th 1581, at Holme, Cumberland, whilst on April 18th 1591, Nicholaus Hayton and Margaret Knobley were married in the same parish. The first recorded spelling of the family name is shown to be that of William de Haitun, which was dated circa 1147 - 1154, in the "Charter Rolls of Yorkshire", during the reign of King Stephen, known as "Count of Blois", 1135 - 1154. Surnames became necessary when governments introduced personal taxation. In England this was known as Poll Tax. Throughout the centuries, surnames in every country have continued to "develop" often leading to astonishing variants of the original spelling.